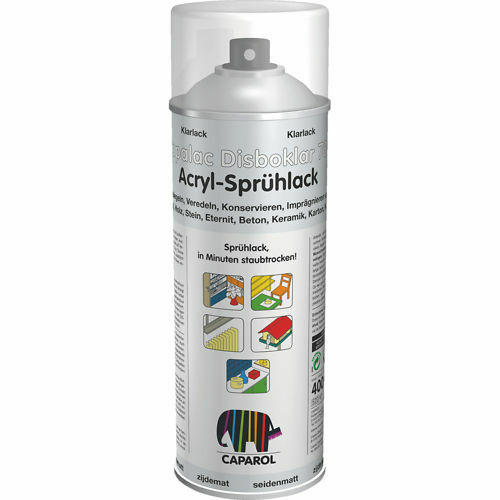 Fast-drying solvent-based coloured acrylic spray lacquer (781), clear coat (782) and corrosion-inhibiting primer for iron & steel (783), for nearly all interior & exterior substrates. Spray enamel (aerosol paint) for shortwork painting on smaller surfaces of wood, derived timber products, iron, steel, zinc (galvanised surfaces), aluminium, copper, rigid (unplasticised) PVC, and sound existing interior and exterior coatings. 782: Transparent clear coat on numerous substrates and for protective sealing. 783: Corrosion-inhibiting primer on iron and steel, especially suitable for angled and hardly approachable component parts. To be used prior to the application of Disbocolor 781. As spray enamels are not subject to the VOC guideline, no VOC indication required.